We are the Best for Less! 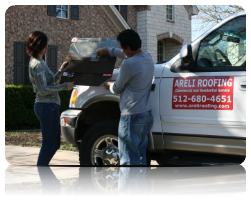 Welcome to Areli Roofing, a family owned and operated Texas roofing company that has served the Austin and surrounding communities for over 17 years. As a premiere Texas roofer, we have roofed more than 5,000 homes and commercial properties and are known for delivering superb workmanship and outstanding customer service. We are committed to excellence and providing customer satisfaction, from a responsive and efficient sales team to professional work crews on site. At Areli Roofing, Inc., quality service, workmanship are the heart of our business. The name "roofer" suggests, the main job description of a roofer is to repair and thatch the roofs of various buildings and structures. A roofer is tasked with covering the roofs of buildings with materials, such as wood, brick, asphalt, tar, shingles, slate, aluminum, bricks and other appropriate materials. He also uses materials to bind, insulate and seal openings in the roofs of houses, apartment complexes and a slew of other structures. "The bottom line is we protect families and their possessions from the harsh environments! Please contact us today for a free quote, and by the way, ask for "Areli"!